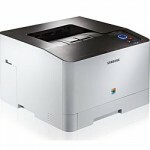 The Samsung CLP-415NW colour laser printer has wi-fi and ethernet connections, so you can print from a range of devices. Text prints look good and sharp. The CLP-415NW colour laser Printer offers fast speed and above-par output quality, making it an excellent choice for micro and small offices with light to medium duty print needs.